Port Elizabeth is known as The Friendly City, The Windy City, Sport Elizabeth, Ibhayi, Nelson Mandela Bay, The 10-minute City (since everything is supposedly within a 10-minute drive) and Algoa Bay. PE has a tropical coastal climate, making it relatively consistent throughout the year. The breeze off the sea keeps temperatures down significantly. The global Iron Man™ competition is hosted by Port Elizabeth every year (15th April 2018). This draws thousands of sportsmen and women from around the world, as well as spectators. PE is one of South Africa’s most important hotspots for the production of motor vehicles and their accessories including Lifesaving SA’s title sponsor, General Tire, a brand of Contintal Tyre South Africa. Port Elizabeth is the largest and most densely populated of the three towns comprising Nelson Mandela Bay. PE is well known for its stunning beaches, which stretch for some 40 kilometres along the coast. 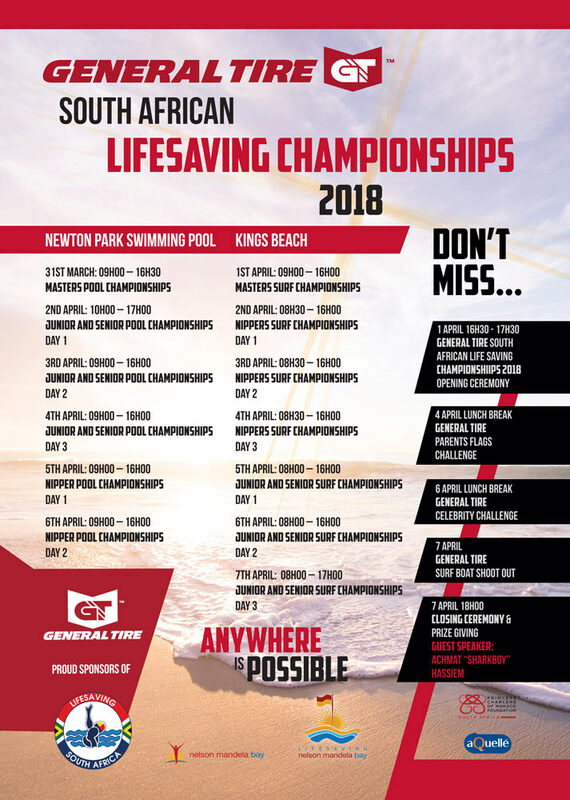 Kings Beach will host the 2018 General Tire Lifesaving South Africa National Championships. Kings Beach has recently been awarded Blue Flag status. PE was one of the Host Cities for the 2010 FIFA World Cup™ and had to have a stadium built especially for this event. Famous sportsmen that were born in PE include Wayne Parnell (South African cricketer), Schalk Burger (Springbok rugby player), Robin Peterson (South African cricketer) and Ashwell Prince (South African cricketer). PE folk are known as Port Elizabethans. The telephone area code is 041. Port Elizabeth is situated approximately halfway between Durban and Cape Town making it the ideal location to host National Champs. I would like to welcome all our competitors, officials, parents and supporters to this historic national championships. This is the first time we have the whole lifesaving sport family in one city, where over the course of this week we will see over 1600 competitors in action both at the pool and the beach. Whenever change occurs many people are apprehensive, but I know when the lifesaving family works together we can achieve anything. I am therefore confident that the General Tire South African Lifesaving National Championships 2018 will be a great success and thank everyone for supporting the idea of unifying our great movement. I wish all the competitors the best of luck, but would like to remind all competitors, young and old, that these championships act as a reward for your dedication to the lifesaving service we provide and that its primary aim is to improve your lifesaving skills. I would also like to remind our nippers and their supporters that nippers are about fun in the sun and making lifelong friends. It is therefore very important to the management of Lifesaving South Africa that all the competitors at these championships compete with a spirit of sportsmanship and fair play. To Lifesaving Nelson Mandela Bay, the organising committee and everyone who has played a part in making these championships possible. I know it was a huge ask to put four of our national championships together into one event over one week, but we couldn’t have picked a better venue. The Nelson Mandela Bay team has never let us down in the past and I know these championships will be the best we have hosted to date. To the officials, these championships will be very demanding and I fully acknowledge that without you we cannot host these events. I therefore extend a huge thank you to you for your time and dedication to the sport of lifesaving. To General Tire and other sponsors who have generously contributed to the success of this event – I would like to extend a heartfelt thank you on behalf of all the members of Lifesaving South Africa. To Treble and all the support services – thank you. To our host city Nelson Mandela Bay, thank you for your contribution and welcoming the lifesaving family to your home. The surf lifesaving fraternity and its service to society is critical to our aspiration of providing safe swimming beaches in our City. Our vision is to be “An iconic friendly ocean City driven by innovation, service excellence and economic development- a destination of choice”. Your services give impetus to this vision. The Championship adds so much value to our city’s status as a premier water sports destination. Certainly an event we are immensely proud of and an event that boasts an unmatched element of competition and camaraderie. Needless to say, our lifesaving fraternity is pivotal through their ongoing support and their role to maintain international standards on our beaches. This is made possible through the role of Lifesaving South Africa, all our clubs and their official sponsor General Tire, through its commitment to drowning prevention, water safety supervision, emergency response and overall promotion of the sport. We wish all the lifeguards and their respective clubs a great championship and invite participants, visitors and spectators alike to take some time off to experience the uniqueness and splendor of our magnificent City, its beaches and pristine coastline that takes pride of place as one of our flagship attractions. To everyone involved in the organization, management, marketing and sponsorship of the championship, we wish you all a great time in the Bay and may you take home happy memories from the 2018 General Tire South African Lifesaving Championship. The General Tire brand is one of adventure and possibilities in that we believe anything is possible. Our sponsorship and investment in Lifesaving South Africa’s National Championships is an extension of this thinking because these men, women, boys and girls, through their performance at the respective General Tire Provincial Championships have consistently shown us that anything is possible in the water and on the beach sand. General Tire is into its second year as the head sponsor of Lifesaving South Africa and it’s our privilege to be aligned with the first ever combined National Championships in one location. It’s also symbolic for us because General Tire, a brand of Continental, is housed in Port Elizabeth. The city’s sporting philosophy is that Port Elizabeth become synonymous with adventure and water sports, and it doesn’t get bigger than the Lifesaving SA surf and pool extravaganza, which will see General Tire and Lifesaving South Africa play host to 2000 competitors from across the country in 528 events. The very best of the best will then be selected to represent South Africa at this year’s World Championships in Australia. General Tire has also invested in the assisting with the costs in getting Team South Africa to Australia, because we know anything is possible. On behalf of the Princess Charlene of Monaco Foundation South Africa, I wish to welcome you all to the highlight event on the lifesaving calendar – the General Tire Lifesaving SA Surf and Pool National Championships. Sport has the power to inspire young people and transform lives. This is the central idea that prompted the launch of the Princess Charlene of Monaco Foundation South Africa that would work to end death and disease caused by water fatalities. Each life lost changes a family forever – many of these deaths are avoidable and it is the Lifesaving community who assist with this change. Last year H.S.H Princess Charlene of Monaco was appointed Patron of Lifesaving S.A. The partnership between the two organisations strengthens the promotion of water safety and supports ‘learn to swim’ projects in South Africa. On behalf of the Princess Charlene of Monaco Foundation South Africa, I would very much like to thank Life Saving South Africa, the Treble group and other sponsors for your support in promoting water safety and preventing drowning. Good luck and enjoy the competition. On behalf of Lifesaving Nelson Mandela Bay and all our local clubs, we would like to extend a warm welcome all out of town clubs to our friendly city Port Elizabeth. The 2018 GTLSA National Championship is said to be the biggest lifesaving event ever to be held in Port Elizabeth if not South Africa. Being part of the local organising committee I can assure all that the 2018 GTLSA National Championship will be one not to be forgotten. Huge amounts of planning and hard work have gone into hosting this event. Thank you to our beach hosts Kings Beach Surf Lifesaving Club and Bluewater Bay Surf Lifesaving Club. Thank you to our pool hosts Seagulls, Hobie Beach and New Brighton Beach Surf Lifesaving Club. Your hard work is noted and appreciated. To Lifesaving South Africa, General Tire, Treble Group and our very own Nelson Mandela Bay Municipality we are more than thankful. Without your valuable contribution and sponsorship an event of such caliber would not be possible. Thank you very much for making it possible. To all technical officials, I take my hat off. From experience I can say you deserve much more credit for what you are getting. It will probably be a first for many of us to officiate for more than 3 days. Good luck and strength for Nationals. To all competitors from nippers to masters I salute you. Without you there is no National Championships to host. You are the hope for future growth for the sport of lifesaving. Remember that not all of us can be winners but all of us can be good sportsmen. Compete in the spirit of lifesaving and have an amazing National Championship.